A tropical storm in the southern Philippines unleashed flash floods that swept away people and houses and set off landslides, reportedly leaving more than 120 people dead and 160 others missing, officials said. Most of the deaths from Tropical Storm Tembin, which strengthened into a typhoon on Sunday, were in the hard-hit provinces of Lanao del Norte and Lanao del Sur and on the Zamboanga Peninsula, according to an initial government report. It was the latest disaster to hit the Philippines, which is battered by about 20 typhoons and storms each year, making the archipelago that lies on the Pacific typhoon belt one of the world's most disaster-prone countries. A search and rescue operation was underway for more than 30 people swept away by flash floods in the fishing village of Anungan, Mayor Bong Edding of Zamboanga del Norte province's Sibuco town said. Five bodies have been recovered so far in the village. "The floodwaters from the mountain came down so fast and swept away people and houses," Mr Edding said. "It's really sad because Christmas is just a few days away, but these things happen beyond our control." Mr Edding blamed years of logging in the mountains near Anungan for the tragedy that unfolded on Friday, adding that he and other officials would move to halt the logging operations. 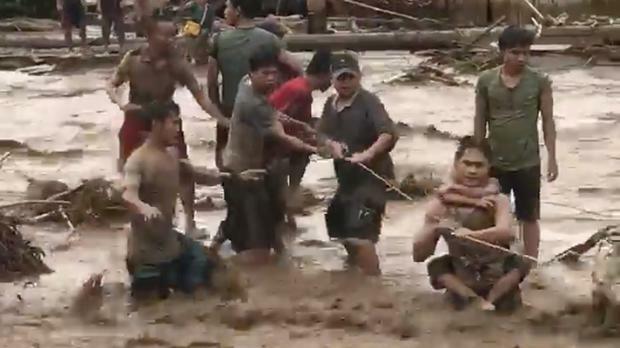 The rest of the deaths were reported in Lanao del Norte, where floodwaters from a mountain also swept away several riverside houses and villagers, and Lanao del Sur, police and officials said. Lanao del Norte officials reported the highest death toll at 64 with 139 missing followed by Zamboanga del Norte province, where officials reported at least 29 storm deaths with 19 others missing. The storm left 21 dead and one missing in the lakeside province of Lanao del Sur, according to the Department of Interior and Local Government. Thousands of villagers moved to emergency shelters and thousands more were stranded in airports and seaports after the coast guard prohibited ferries from venturing out in the rough seas and several flights were canceled. The storm, known locally as Vinta, strengthened into a typhoon and picked up speed late on Saturday, packing maximum sustained winds of 120 kilometres (75 miles) per hour and gusts of up to 145 kph (90 mph). It struck the southern section of western Palawan province and is forecast to blow away from the southern Philippines on Sunday toward the South China Sea. "It is unfortunate that another tropical cyclone, Vinta, made its presence felt so near Christmas," presidential spokesman Harry Roque Junior said, adding that food packs and other aid were being distributed in storm-hit communities. Earlier in the week, a tropical storm left more than 50 people dead and 31 others missing, mostly due to landslides, and damaged more than 10,000 houses in the central Philippines before weakening and blowing into the South China Sea. Among the areas battered by the latest storm was Marawi, a lakeside city in Lanao del Sur that is still recovering from a five-month siege by pro-Islamic State group extremists that left more than 1,000 people dead.